Woohoo! I finally bought myself a tripod today, so I should be able to start blogging some more recent outfit shots soon, but first here’s another of my pending posts from Melbourne. 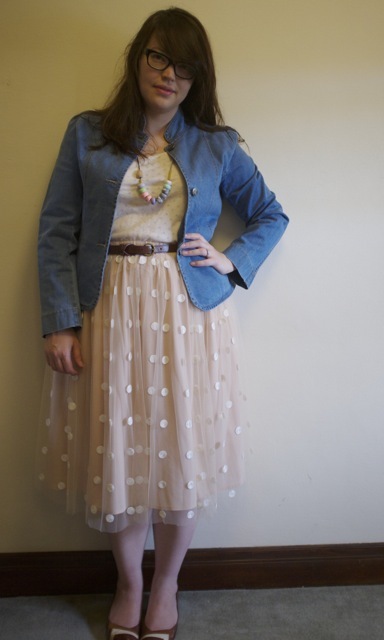 If I’m being perfectly honest, I’ve never really been a denim jacket kind of girl. Generally speaking they’re are very casual and a little shapeless; and with my narrow shoulders and full bust I find that most of the time they make me look butch and masculine. Plus, I can never figure out what I’m supposed to wear them with: To me “casual” means “jeans”, but I’m pathologically afraid of double denim, so I’d never wear a denim jacket with denim jeans. However, every rule has an exception, and Embody’s “Embrace” denim jacket seems to buck the trend of shapeless, androgynous denim jackets. 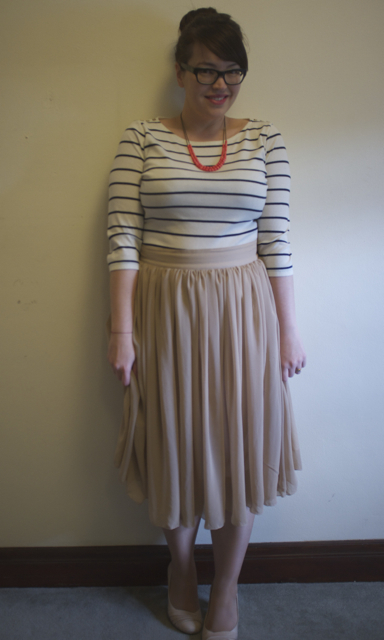 It has a curvy silhouette emphasised by a heavily panelled design that is reminiscent of a gored skirt. The mandarin collar and curved pockets lends it an elegance that’s lacking in traditional denim jackets. 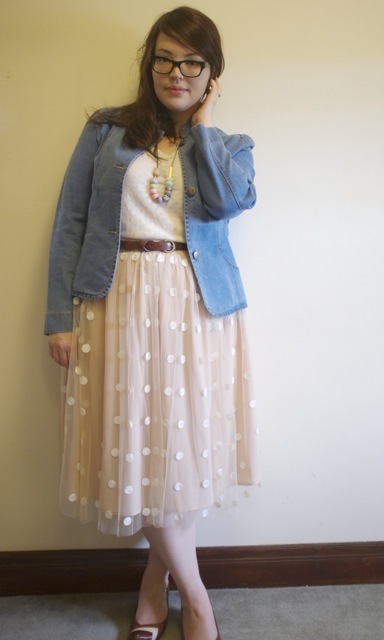 I teamed it with my Yesstyle skirt to give the sweetness-and-light combo of pink polkadots and tulle a bit more of a edge. The shoulders still sit a little broad for me, and the jacket doesn’t really work as well done up (but that’s probably my Rack O Doom). 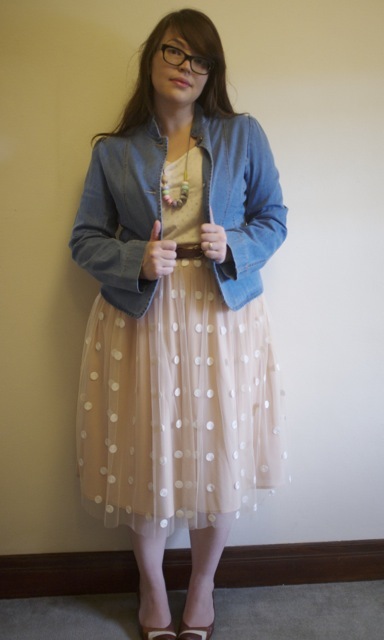 The pale “vintage” blue is a good hue to team with summer dresses as a cover-up in the evening, but the jacket’s also available in an Ink colour that would work in the colder months. 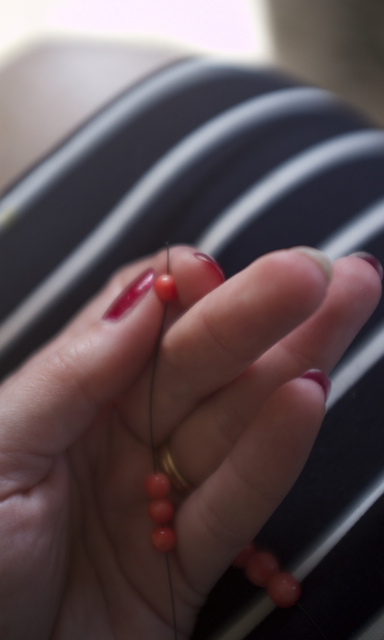 Also new in today’s post – I finally managed to make a decision on which of the delicious Made By Emily Green polymer bead necklaces I was going to make my own! 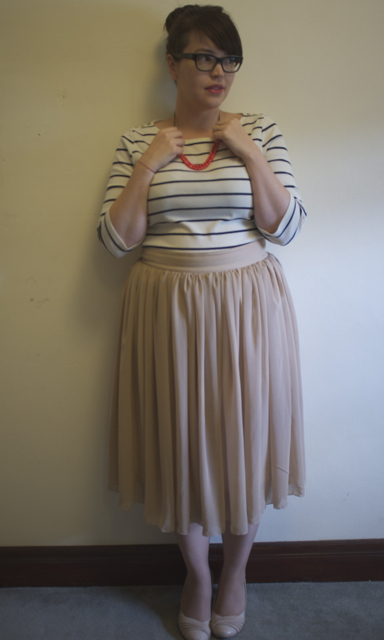 I snaffled up this beauty at the last Finders Keepers Market in Melbourne, and I’m beyond delighted. The black and white woven cord, brass and wooden elements, and patterned and glitter enhanced beads makes it very different from my own slightly bodgy DIY‘d take on her traditional bead necklaces. 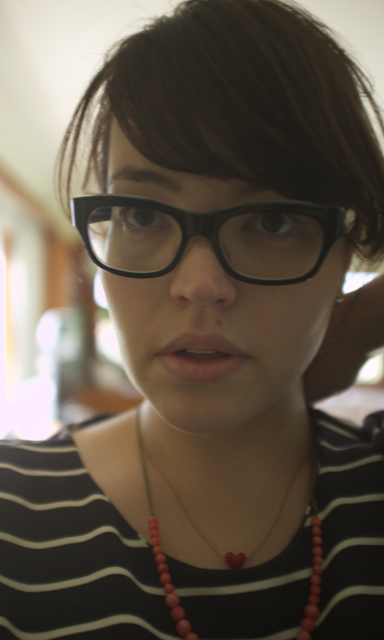 I like that her styles are developing and evolving, and they way she puts colours together is awe inspiring. Yes! Hi! Hello! Not dead, obviously! Two weeks since my last post. 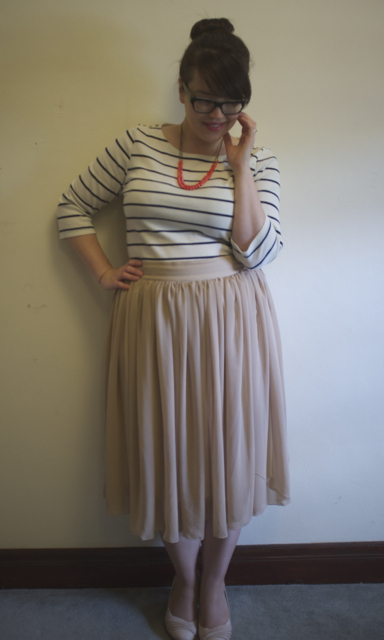 Bad blogger. This year is just racing away, I can’t believe it’s almost October, though I’m glad to see the blossoms in the trees, the warmer days, the light that lingers into the evening. 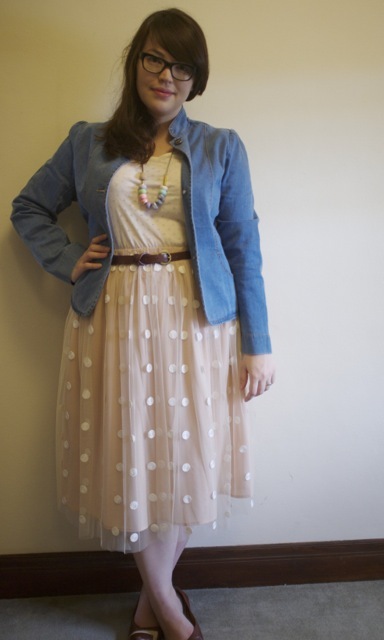 It’s a great little chiffon number – much better quality that the cheapie that I bought from eBay – in a kind of a tannish blush with a stretch lining and a zippered fastening. 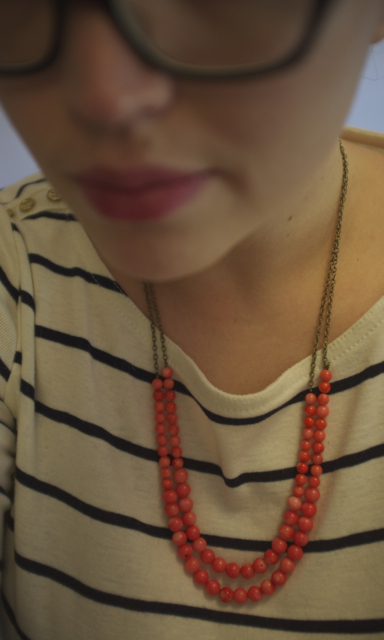 I’d’ve liked it a little peachier, and a little less brown in hue, but I can play up the pink with my new coral necklace which I DIY’d using the same technique as my favourite yellow beaded necklace. I did promise a tutorial, so here we go! 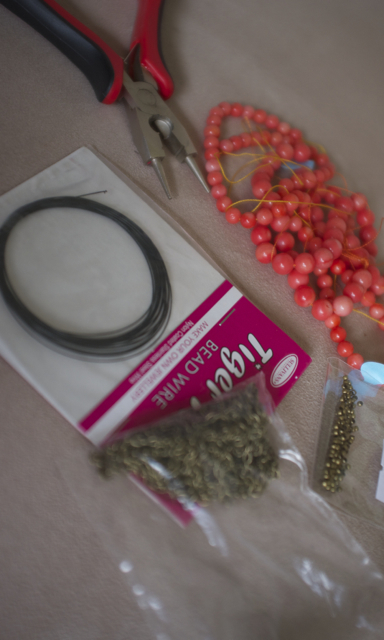 To start with, you’ll need some tiger tail beading wire: the plastic coated, kind of flexible kind, don’t buy the rigid beading wire because you want the beads to hang naturally. You’ll also need some chain (I chose antiqued bronze), some crimp beads, a clasp, and obviously the beads that want want to feature. For the yellow necklace I just used twelve largish faceted yellow beads, but for this necklace I wanted a graduated effect, so bought two different sizes of coral beads. Step 1. 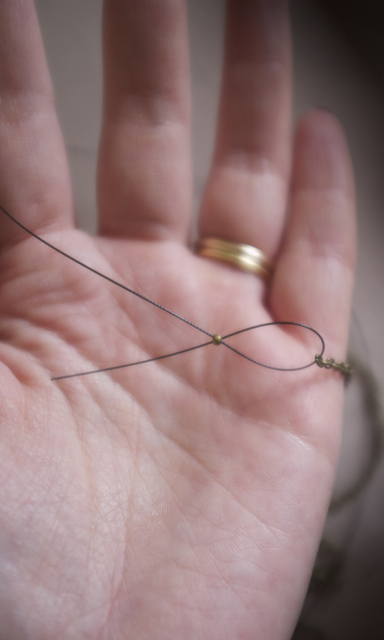 Start by threading a crimp bead over a length of tiger tail. Step 2. 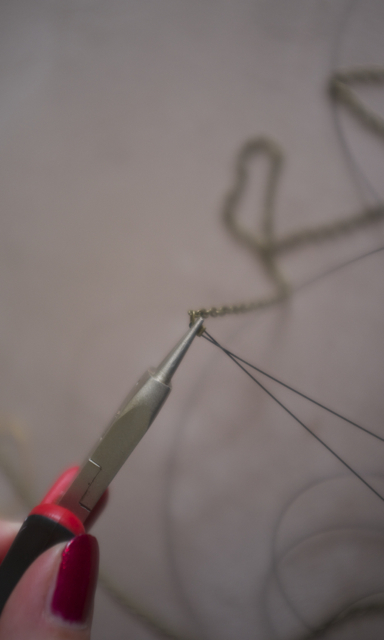 Thread the tiger tail through the last link of the chain. Step 4. 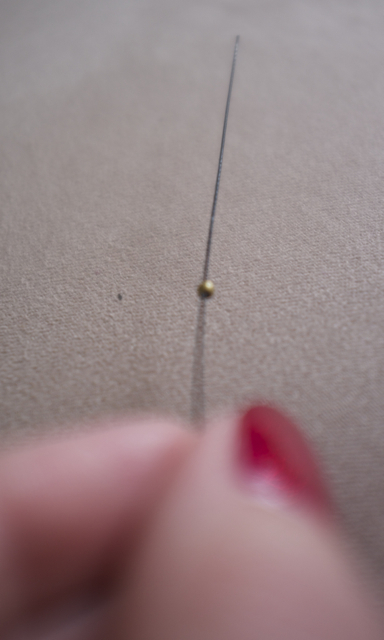 Draw the crimp bead tight up towards the chain, then crimp tight. Step 5. Lay out your beads how you’d like to thread them. To get the graduated effect I obviously had the large beads in the middle, then equal quantities of the smaller beads on either side. 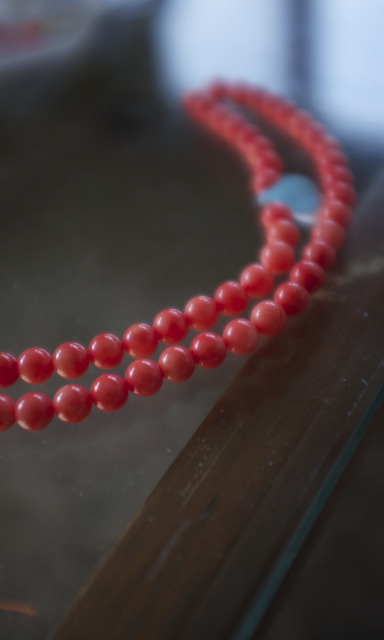 I made the coral necklace double layer, so I laid out a few more beads for the lower string than the upper. Step 7. 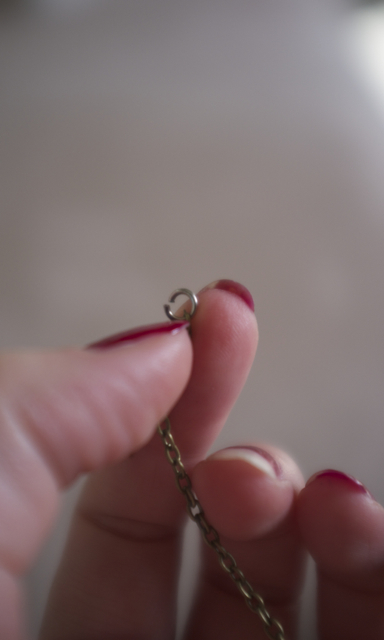 As you reach the second thread of beading wire feed that through the first few beads as well. Step 8. 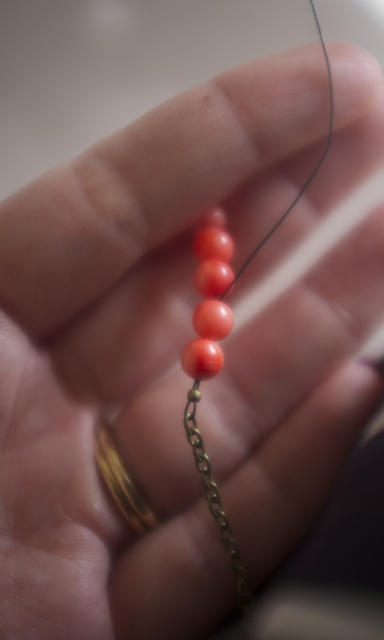 When you reach the end of your row, repeat the order of crimp-chain-crimp, then feed the end of the tiger tail back though a few of the beads at this end, too. Step 9. 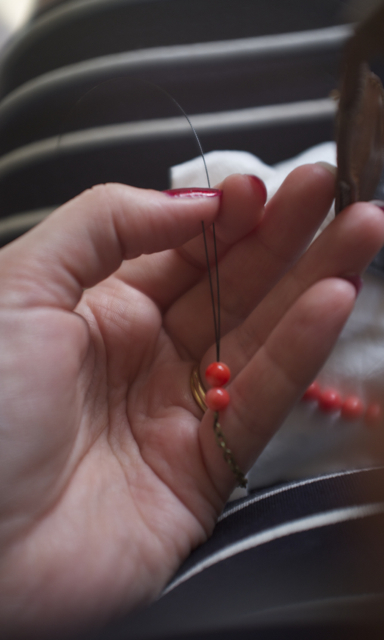 Pull the tiger tail tight until the row of beads come up flush against the chain, then crimp the crimping bead closed, and trim both ends of excess tiger tail away. Step 10. Voila! At this point you should have pretty much the makings of a necklace. Step 12. 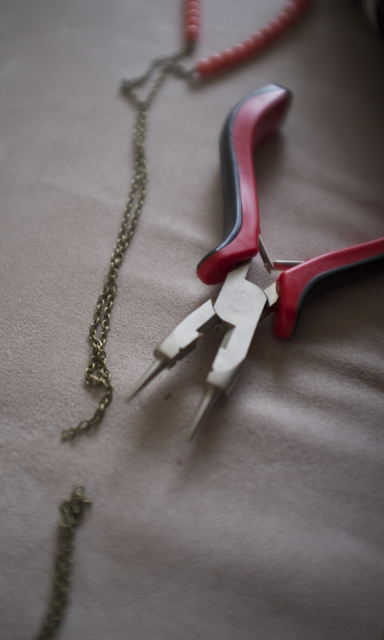 … and cut the chain to the right length. Step 13. 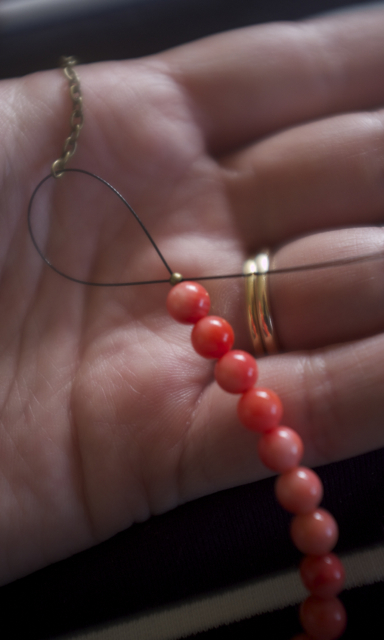 Then attach the clasp at the two ends, and you’re done! 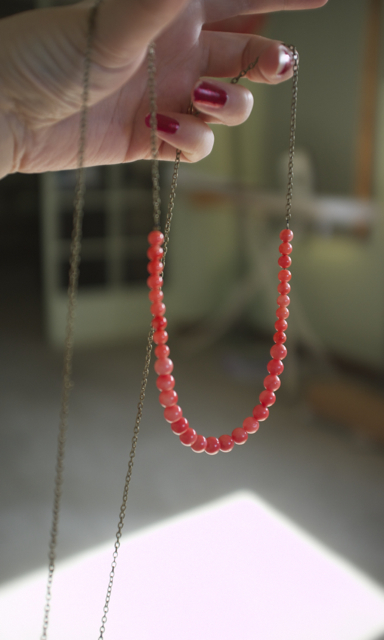 One DIY’d beaded necklace! If you want to do the “advanced” (not really!) 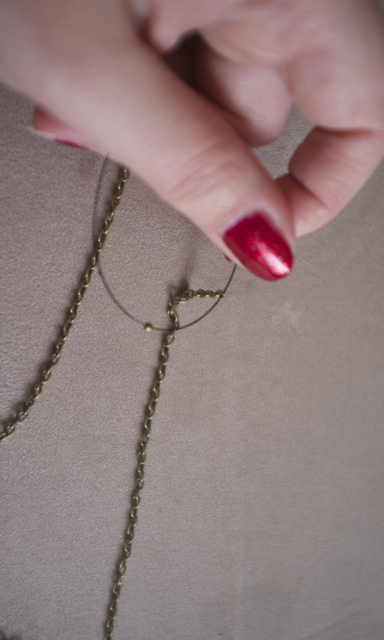 double strand version, just repeat the steps, making the second necklace a few centimetres longer, then attach the clasps to both necklaces, so the two are fastened with the same clasp.